Multiwall paper bags play an active role in many different industries and many different environments. At Gelpac, we know that a “one size fits all” approach will always be less than optimal and can often have unintended and dire consequences on your efficiency, reputation and bottom line. Producing the right bag for your operation starts with our thorough understanding of your exact requirements and specifications. Our production and quality assurance teams then spring into action. Drawing from Gelpac’s extensive raw materials inventory our skilled personnel use their deep-rooted experience to rapidly manufacture the required type of bag using our state-of-the-art production line. Our ability to quickly provide you with various bag configurations—including bags with valves offering a superior quality seal, bags with easy-open bottoms or backs, bags with a safe and proven insect-resistant coating or any other type of bag with an optimal price/quality ratio—is second to none. We are justifiably proud of our hard-earned reputation as a company that can quickly and cost-effectively provide you with the highest quality products. While we show you some of what we accomplish, certain proprietary equipment and processes must remain for-your-eyes-only. We will be happy to set up a comprehensive tour at your convenience. 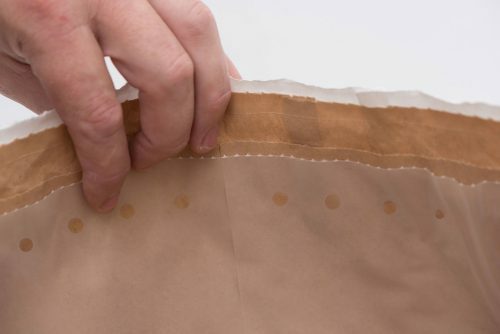 Tough, economical and easy to open single or multiwall paper bag, sewn at one end. Ideally suited for dry goods that do not necessarily require barrier protection. One- to six-ply assembly with brown or white outer ply and available color graphics. A paper bag, closed at both ends with a valve insert in one corner designed to allow high filling rates and optimal sift resistance and pallet set-up. Ideally suited for powder or granular products. One- to six-ply assembly with brown, white or clay-coated outer ply and available color graphics. Multiwall paper bag, glued and folded at one end with a pre-applied coating of hot melt adhesive applied at the other end to provide an efficient sift-proof closure. May also be sewn shut. Ideally suited for products that vary in density. One- to six-ply assembly with brown, white or clay-coated outer ply and available color graphics. This is a paper bag with a pasted bottom closure. Ideally suited for products that vary in density. One- to six-ply assembly with brown or white outer ply and available color graphics. Paper bag with a square bottom for easy filling. Ideally suited for products with an irregular or uneven shape. One- to three-ply assembly with brown or white outer ply and available color graphics. Environmentally friendly, large size multiwall brown paper bag with simple graphics and a square bottom for easy filling. Highest value product of its class. Created to reduce overpacking and waste yet still providing a bag that will be sturdy and keep your dairy product contaminant free.